Please note that the content of this book primarily consists of articles available from Wikipedia or other free sources online. 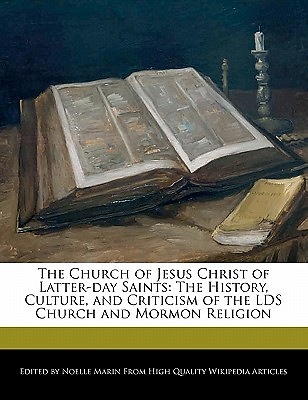 This book highlights the history of the Church of Jesus Christ of Latter-day Saints including its founder, Joseph Smith, Brigham Young, and the Utah War. It also covers the culture and criticism of the church and the Mormon religion, the membership practices and statistics, and Mormon Fundamentalism. Project Webster represents a new publishing paradigm, allowing disparate content sources to be curated into cohesive, relevant, and informative books. To date, this content has been curated from Wikipedia articles and images under Creative Commons licensing, although as Project Webster continues to increase in scope and dimension, more licensed and public domain content is being added. We believe books such as this represent a new and exciting lexicon in the sharing of human knowledge.